Welcome to the Honest Pearls Storefront! I created Honest Pearls in order to bring people closer to the truth about pearls, where they come from, and the abundance of possible creations that pearl producing molluscks yield. I invite you to browse through our selection of quality pearls and shop with confidence, both in your security and our validity. Our pearls are purchased on location from companies who own their farms and I carefully choose each pearl from a wide selection. All of our jewelry is custom made in Hawaii by fully trained individuals who share healthy lifestyles and positive spirit. Each piece is made with care and with the intention that it will bring the wearer serenity, balance and joy. We are eager to share our experience and knowledge, so please feel free to contact us with any questions, suggestions, or special requests. These are the latest creations to emerge from the Honest Pearl "Mollusck." Anything in this category has been added within the last 30 days. Organize your shopping experience by Jewelry Type: Rings, Pendants, Earrings, Necklaces, Bracelets, and All Pearl Strands. Both beautiful and affordable, this categories allows you to shop by price. Pieces are also represented in their respective jewelry categories. Welcome to your very own workshop! Here you can choose between just pearls, just findings, or creating your own pieces. 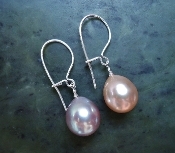 This category features casual, elegant pearl jewelry that incorporates natural components found on Hawaiian beaches. Honest Pearls marries personality, style and pearls. Here are some examples of our customized creations.